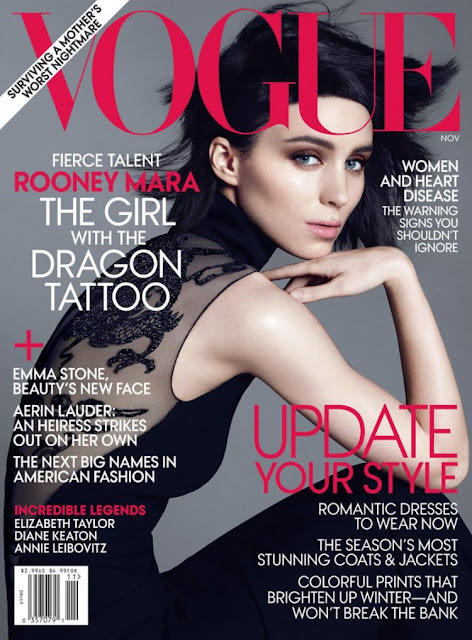 Although I prefer the Swedish version of the trilogy "Millennium Series" by Stieg Larsson than the Hollywood one , Rooney Mara has won deservedly the title of "the girl with the most stylish wardrobe". The Girl With The Dragon Tattoo starlet has been everywhere promoting the thriller. Gothic glam? No! Excellent choices of striking, monochrome couture, structured designs topped off with a dramatic slick of raven hair. Ow my Gosh it's her, I even didn't recognize her at first!! She is the complete opposite of the character she played! Thanks for visiting my blog and leaving such a nice comment! I'm definitely following you too!